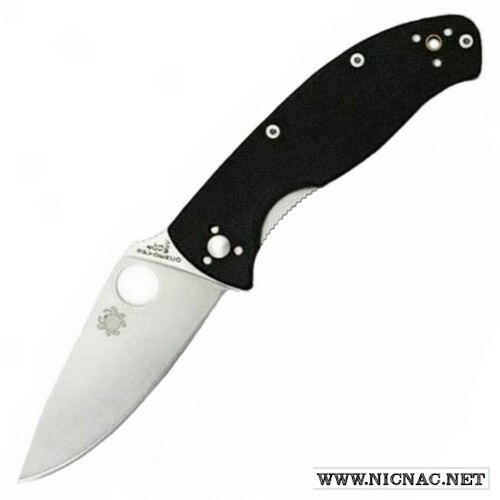 Spyderco Knives Tenacious C122GP Folding Manual Knife G-10 laminate handle and Satin Blade, Overall open length 7 3/4 inches with a 3 3/4 inch 8Cr13MoV blade. Right or left hand carry, tip up or tip down. The Spyderco Knives C122GP Tenacious Folding Manual Knife is a mid-sized knife with a G-10 laminate handle and a Satin Blade. It is overall open length 7.76 inches with a 3.39 inch 8Cr13MoV drop point flat grind satin blade. It is made for ambidextrous (right or left hand) carry and tip up or tip down. It is a liner lock and also has a thumb hole for easy opening. Great for every day carry. It weighs in a 4.10 ounces.